Well it's almost that time of year. 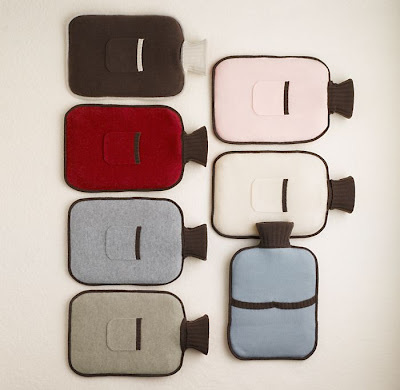 Yep, hot water bottle season here in chilly San Francisco. The rest of the country is warming up and gearing up for summer. We here in the Bay Area will be getting ready for long cold nights and foggy days. I usually spend the summer in San Francisco dreaming of cold beers on hot summer nights, lazy days by the pool, peach picking in August and 4th of July picnics. However, my reality is trying to stay warm in my house when it's not quite cold enough to turn on the heat. Besides, I have a mental block to turning on the heat in July...it just feels wrong. What does feel right is a hot water bottle. My childhood memories are dotted with someone snuggling a nice warm bottle next to my feet. Vague comforting memories of somebody taking care of me and tucking me into bed with that bottle and teddy bear. Steaming hot at first with a towel wrapped around to ward off burns. Then by morning the hot water bottle would have cooled off until it was simply lukewarm to the touch. Occasionally when the cold gets to much for me I still boil up a hot water bottle. It's just about the most comforting feeling in the world for me, but I want to upgrade. I've found a cashmere cover! It makes the mundane just a little more special. Obviously I must get the pink one.